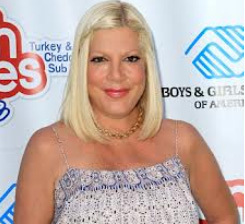 Tori Spelling has received a better-late-than-never push present from hubby Dean McDermott. The jade and gold ring was given to Finn’s mommy over the Christmas holiday. The new mom (for the fourth time!) had placenta previa and could have died during child birth. Congrats to the couple, but shame on Dean for not exercising proper push present etiquette. Making a new mommy wait that long, especially after such a difficult pregnancy, just seems criminal. But, any woman would probably forgive a few month delay when the gift comes from Neil Lane. The antique ring originated in China and features a cabochon-cut jade stone in a 10-carat gold ring with ornamental artwork. The ring is almost 100 years older than Finn!